There’s a tractor double-parked outside the boulangerie of a tiny village in the Swiss canton of Vaud. Small, bright red, quaintly cute. It stands in sharp contrast to the automotive high society here on the shores of Lake Geneva—or Lac Léman, as it’s called in French. Stately luxury sedans and sleek sports cars vie for supremacy on local roads; cosmopolitan Geneva and Lausanne—known as the “Olympic capital”—are not far away. Yet somehow the tractor fits in all the same. It's a Porsche Diesel Junior, model year 1958. And it’ll soon be driven by a man who brings glamour of his own. In hand-sewn shoes, Karl-Friedrich Scheufele climbs onto the one-cylinder with a bag of bread rolls in his hand. He’s clearly no farmer; in fact, he’s the copresident of the Geneva-based watch and jewelry manufacturer Chopard. He's on his Sunday drive. He goes through the start procedure for the Porsche tractor with an experienced hand: turn the throttle counterclockwise toward full throttle, push in the ignition key (which, unusual for a Porsche, is located on the right), hold the pull knob halfway out for a few seconds to preheat, and then pull it all the way out. Now the starter begins to crank and shortly thereafter the diesel is running on its own steam. The clutch calls for a good deal of force. It's almost as if it wants to test the quality of the shoe's stitching. Release the hand brake on the right, pop it into first gear. And off you go. Karl-Friedrich Scheufele appreciates the archaic charm of a single cylinder. He enjoys every minute of the drive. Every ignition is a celebration, every turn around the bend a benediction. 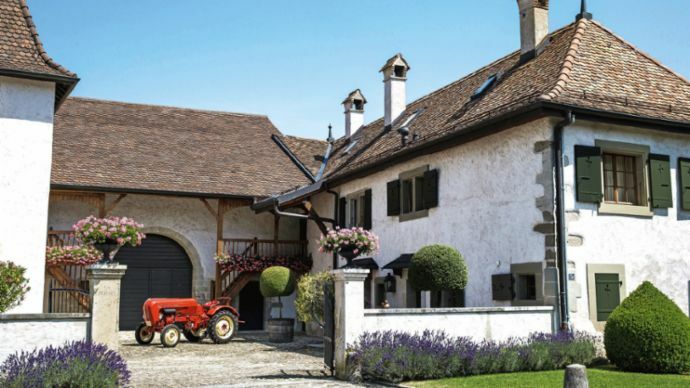 A narrow country lane, skirted by shady birches and grazing cows, takes him home to his family estate on the shores of Lake Geneva, a restored manor dating back to 1695. A cobblestone-paved courtyard, geraniums, oleander shrubs, climbing roses, and lavender—this is the home of Karl-Friedrich and Christine Scheufele and their three children, as well as an equal number of Leonberger dogs. The Scheufeles hail from Pforzheim, Germany's Golden City. Karl Scheufele III, Karl-Friedrich’s father, took over the Geneva-based watch label Chopard in 1963. The esteemed watchmaker was founded in 1860 by Louis-Ulysse Chopard, the son of a farmer from Sonvilier in Bernese Jura, a town with a long and rich watchmaking tradition. Chopard supplied the court of Czar Nicholas II with his little works of art; today, the Scheufeles serve the whole world. Chopard is one of the last family-run watch and jewelry makers worldwide, led by siblings and copresidents Caroline and Karl-Friedrich Scheufele. 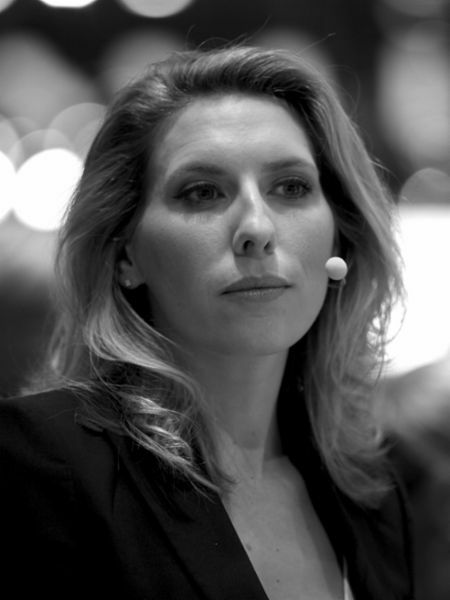 While Caroline is responsible for the women’s collections, first developing the jewelry section and later the high-end jewelry department, Karl-Friedrich has been responsible for the sports watches of the men’s collection since the 1980s and for the Chopard Manufacture since the 1990s. The Chopard company employs more than two thousand people in more than forty artisanal professions. At a time when many manufacturers were flooding the market with quartz watches, the family invested in a small factory for mechanical movements in the Jura village of Fleurier to cement its place in haute horology. This is where complex chronographs, tourbillons, and perpetual calendars are crafted—masterpieces embedded in artful rose-gold and platinum cases, adorned with hand-engraved guilloche dials made of solid gold or silver. They are all inscribed with the initials L.U.C. (for founder Louis-Ulysse Chopard), bear the traditional company logo as a seal of quality, and carry the sought-after certificate of the Official Swiss Chronometer Testing Institute. Scheufele is a nostalgic soul. 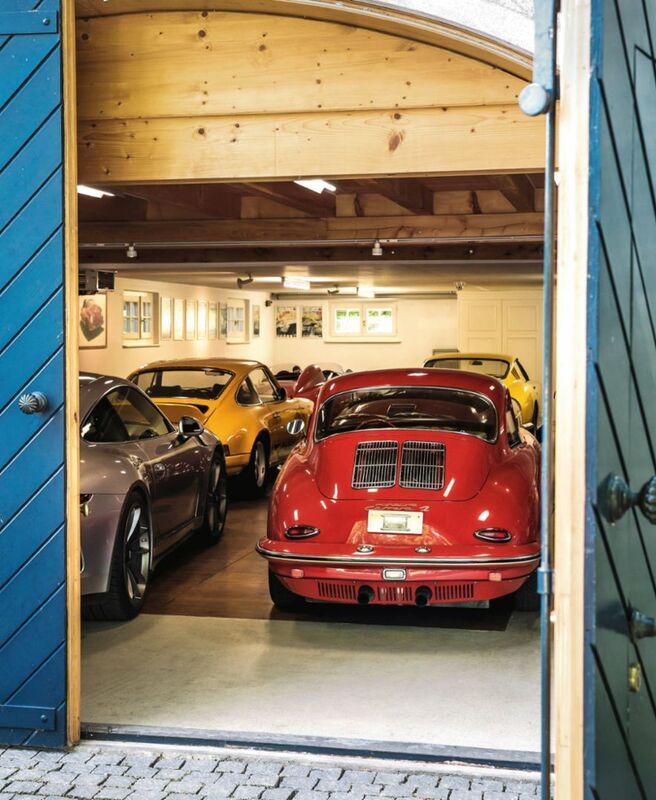 A glance at his garage, a former abbey just across the road from the house, makes that plain. He drives the Junior in as if entering a museum. A wine-red Porsche 356 Speedster 1600, model year 1954, is parked there. Next to it, also red but with a touch more yellow in the paint, is a 1963 Porsche 356 B Carrera 2. A silver 1973 Porsche 911 T 2.4 provides a bit of contrast to the red. The yellow 1974 Porsche 911 Carrera RS 2.7 exudes power and almost overshadows two later models: a silver-gray 911 Turbo (built in 1997) and a charcoal-gray 911 R from 2016. 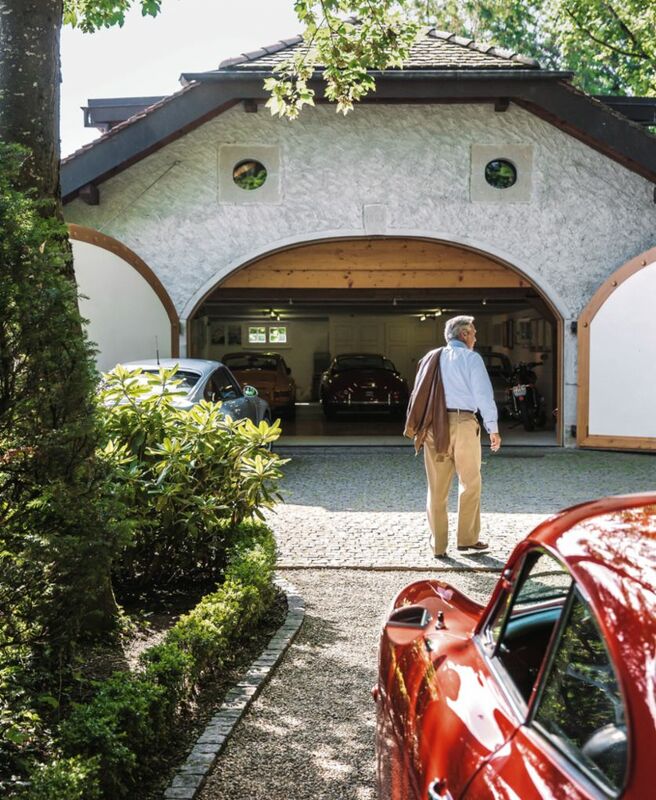 In this exclusive Porsche sanctum, the successful sexagenarian Mr. Scheufele reverts to the ecstatic youngster Karl-Friedrich: “From childhood onward, I was fascinated by cars, especially Porsches.” His first car was a bright-yellow Volkswagen Beetle convertible. He drove it until the day he could afford a Porsche 911. There was nothing in between. 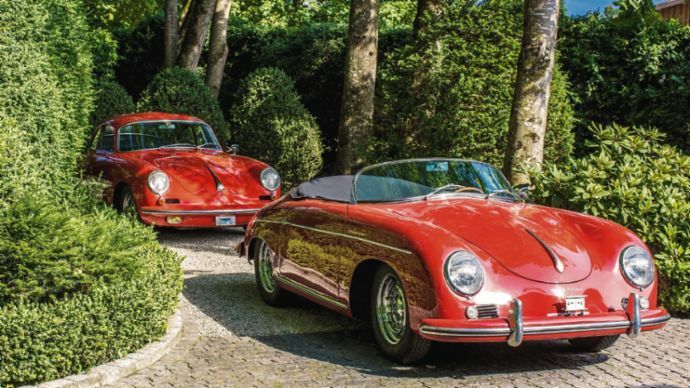 The wine-red Porsche 356 Speedster 1600 from 1954 has been in Scheufele’s collection for three decades. A restored estate is Karl-Friedrich Scheufele’s place of refuge. 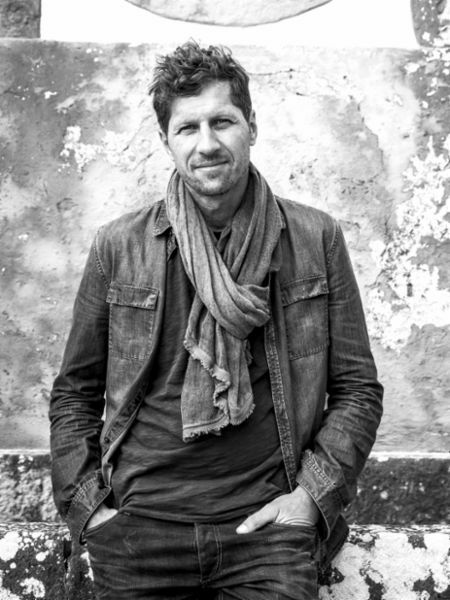 Scheufele brought his private passion to his business life. Chopard has been a partner and official timekeeper of Porsche Motorsports since 2014 and a sponsor of the Mille Miglia since 1988. Each year since then, Chopard has released the matching timepiece for the legendary concours through the north of Italy. Scheufele has driven the thousand miles from Brescia to Rome and back twenty-eight times, usually accompanied by his good friend and racing legend Jacky Ickx. That was certainly the case with his Speedster, acquired some three decades ago. A touch-up of paint revealed a thick layer of filler across the entire rear of the car; there was practically no body to speak of underneath it. Scheufele took a deep breath and made a decision: a complete restoration.